There is a lot of skepticism about the year 2012. Depending on who you are listing to, there are all sorts of theories, even ones speaking about the end of the world or the end of time. Other theories even predict the end of the universe as “predicted” by the Maya. But what did the Maya actually leave behind in their records regarding the year 2012? That question dominated the lecture presented by Dr. Mark Van Stone on the night of Wednesday, January 11th, at the Bliss Center in Belize City. According to Dr. Van Stone, a world renowned author, Maya expert, archeologist and professor of Arts at the Southwestern College of California, USA, the year 2012 represents “a period ending”, for the Maya. “A period ending” is a Maya date that is very important to the Maya. It was a date ending with a lot of zeros just like our year 2000. To them, the year 2012 was a number that they wrote as 13 followed by four zeros; 13 times a 400 year period since the creation of their world and that’s a period of just over 5,125 years,” explained Van Stone. The main piece of evidence is located in the ruins of Palenque in Chiapas, Mexico at the monument called the West Tablet of the Temple of Inscription. “The king that was buried at the temple was crowned on a certain day. On the anniversary of that day in the year 4772 AD, which for them was 4000 or more years in the future, they would celebrate the anniversary of his coronation. That piece of evidence tells us that they [the Maya] did not believe the calendar would stop or even restart at 13.0.0.0.0, but would continue to 14.0.0.0.0 then to 15.0.0.0.0 and so on. That tells us that the calendar does not stop, it does not restart, it continues and it also tells us that they did not expect the world to end or change profoundly for the better. I think that is the most important piece of evidence,” explained Van Stone. According to Van Stone, there are several inscriptions that show that the calendar was regarded differently by various groups within the Maya civilization, which shows different schools of philosophies that made powerful statement, such as the inscription at Palenque. 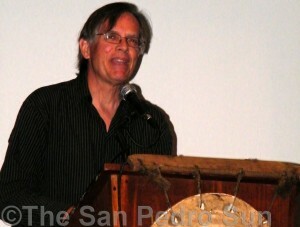 “Almost nobody who is writing about 2012 knows anything about the Maya. You will find all this speculation about what will happen in 2012 and that is just that, speculation,” clarified Van Stone. 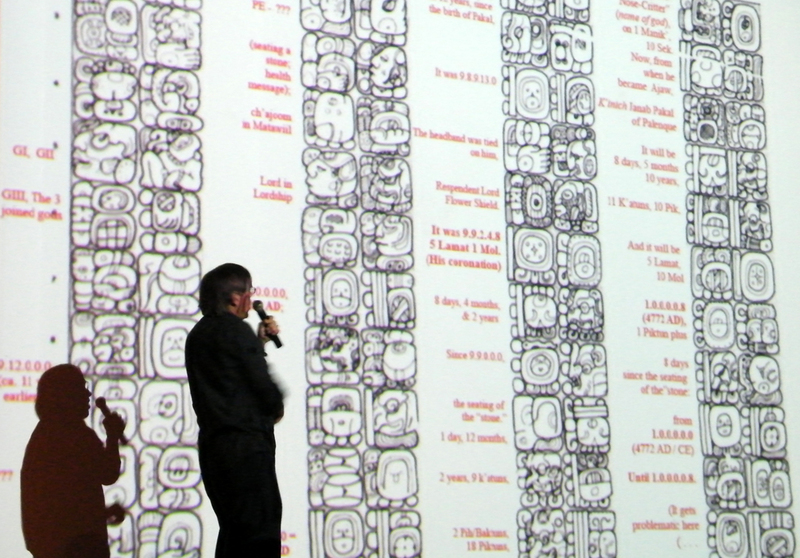 In his lecture Van Stone explained that one of the interesting things about the Maya is that they made mistakes which they choose not to correct. “One of the interesting things in the Maya world view is that they apparently believed that a card laid was a card played. We know this because they made arithmetic mistakes; they added six and seven and came up with 15. They must have thought that the gods intended for them to make that mistake. There is no evidence of any ancient Maya making any correction at all,” added Van Stone. What makes the year 2012 important for the Maya is that in using the long count calendar, it reaches a round number since the day of creation. “Round numbers were important to them. Dates that ended in two or three zeros were extremely important to them because it’s sort of an anniversary during which they sit and look back at their progress. They perform ceremonies on these dates. They would repaint and rebuild things on these period ending dates. Maybe half of the large inscription that the Maya erected begins with a date that is a round number date so the number 13.0.0.0.0 must have constituted a very important period ending,” emphasized Van Stone. Van Stone said that other ancient civilization like the Aztecs, who used a 52 year cycle calendar (different than the long count calendar used by Maya) had prophesies of their own regarding the end of their calendar. According to Van Stone, the Aztecs believe the world will end with an earthquake in 2027. Then there is the return of Quetzalcoatl that the Aztecs predicted in 2039. “The Maya were not prophets of doom. They are a lot more interesting than that. The Maya are worthy of our admiration and respect. 2012 is a time to learn about the Maya that still occupy some parts of the Yucatan Peninsula, Guatemala and Belize and this year is an opportunity for people to see how wonderful the Maya culture really is instead of what they might have been taught,” ended Van Stone. 2012 (13.0.0.0.0) is the year of Bak Tun for the Maya civilization. The Countdown has begun: Belize 2012!